The Nutritional Epidemiology Group at the University of Leeds successfully secured a National Institute for Health Research (NIHR) grant to investigate the use of mobile phone technology to help people lose weight. The Group contacted Blueberry as it required proven software expertise in mobile technology and database systems to help instigate the study plan. A database of 35,000 common food items, which allows the user to record what was eaten throughout the day in a food diary. “Photo mode” where the user can use the phone camera to take a photo of a meal as a reminder for completing the food diary. “Favourites” feature to store common meals to make data entry easier. 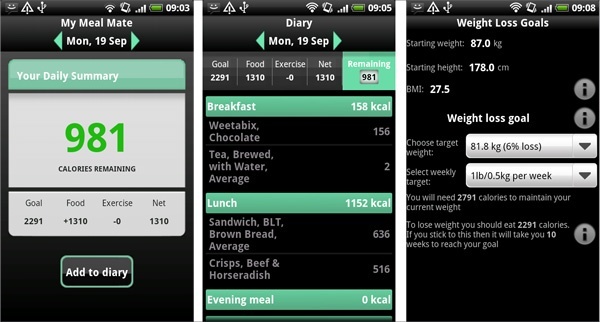 Exercise entry to log calories used during the users’ daily exercise. Target weight loss settings, with limits to prevent unhealthy rates of weight loss. Upload of diary entries to a reporting website. Text message feedback based on the user meeting targets and completing the diary. Details of all diary data entered can be uploaded and viewed. Reports can be generated for common views such as Average Consumption and Daily Upload Analysis. Daily export of data can be performed for further statistical analysis. The My Meal Mate mobile application designed by Blueberry provides Leeds University and the Nutritional Epidemiology Group with a number of commercial advantages over existing phone applications. These include the benefit of customised features – such as the ability to upload data to a website for further analysis – as well as the long term advantage of the client retaining the IP of the program. In addition to providing software expertise to the Nutritional Epidemiology Group, Blueberry also played a strong technical consultancy role within the Group – in particular with selecting the most appropriate phones for the project; generating custom reports and producing the specialised reporting website.